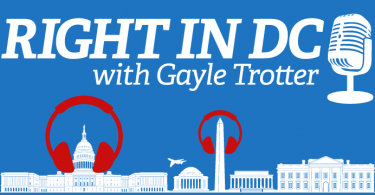 My guest on RIGHT IN DC is Debbie Hines, a practicing trial attorney who lives in Washington, DC. She has a boutique law firm practice focused on civil and criminal law. After graduating from George Washington University School of Law, she started her career in Baltimore as a prosecutor where she tried homicides, attempted murders, rapes, burglaries, robberies, narcotics, and economic crimes before juries and participated in grand jury investigations. She then went into private practice where she represented clients in courtrooms in jury trials across the country and has tried cases in federal courts, appellate and local state courts. Debbie frequently appears in the media as a legal commentator and legal analyst addressing high profile legal cases. We first met when we were recently on a law panel on Laura Ingraham’s show on Fox News. What a picture of it in a yearbook communicates? Today our guest is Debbie Hines. 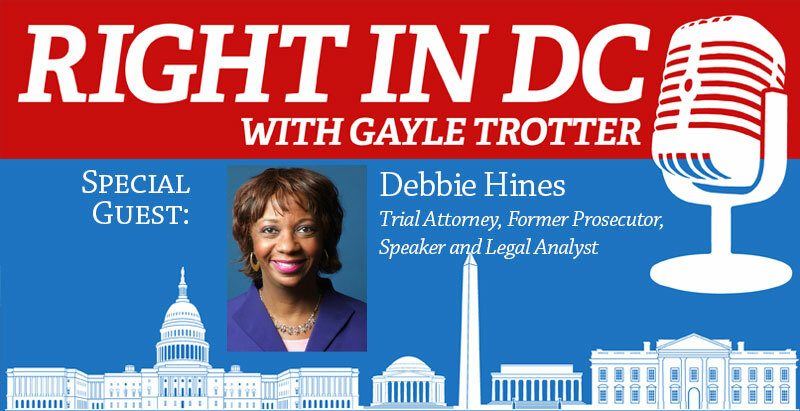 Debbie Hines is based in Washington, D.C. She is a practicing trial attorney and former Baltimore prosecutor. She has a boutique law firm practice focused on civil and criminal law. She started her career in Baltimore as a prosecutor where she tried homicides, attempted murders, rapes, burglaries, robberies, narcotics, and economic crimes before juries and participated in grand jury investigations. Debbie, thank you so much for joining us today. 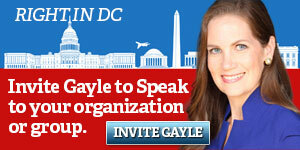 Gayle, thank you for having me. I notice you graduated from George Washington School of Law in D.C., which is also where my father graduated from law school. So you all have the same alma mater. I am very excited to speak with Debbie today. We first met when we were both on a law panel on Laura Ingraham’s show, the Ingraham Angle on Fox News and I was very charmed by Debbie and while we may not agree on many things, she has a very astute way of looking at things and a sharp mind. 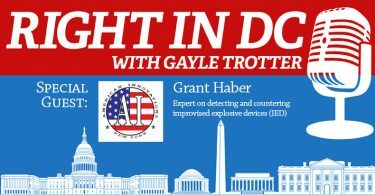 I thought she, being based in D.C., would be a perfect guest for Right in DC. Thank you so much, Debbie for joining us. Great to be here, Gayle. You wrote a piece on your blog, Legal Speaks, entitled “Ralph Northam’s Photo Makes My Blood Boil.” I couldn’t think of a better title for a piece and digging into your piece, you talk about the recent news of the Virginia Governor’s handling of the revelation that when he was 25 years old, his medical school yearbook, on his page, had a very offensive photo. Can you tell us a little bit about the news about this photo and the revelations about it that we heard last week? I think it’s really important to put the photo in context for everyone. What the photo shows is, allegedly, Ralph Northam in blackface standing next to someone else who is represented as being a KKK member. It’s on what is definitely his yearbook page from medical school. When I look at anything like that, it does make my blood boil. He’s 25-years-old. Even though it’s 30 years ago, you have to put in historical context what blackface means for African Americans and Ralph Northam was old enough to know what it meant, too. Starting in the 1800s and all the way into the 1900s, there were white performers, white actors, white musicians that would paint their faces black. And you say, “Well, what’s wrong with that?” It wasn’t just the painting of the face black, which was depicting a black person, but it was the way that it was handled. The shows were to ridicule, dehumanize, degrade show African Americans as less than human, as childlike, as inferior to whites. When African Americans see blackface on a white person, such as Northam, it does make our blood boil. In those shows, were African Americans ever portrayed positively or was it always the case that the actors who were in blackface were ridiculing and making fun of black people? To bring this up in context, no. They were always ridiculed. As far as the media going past blackface, but just dealing with how African Americans have been portrayed in the media, on theater, in arts, which is what we’re talking about, I hate to say this, but it really wasn’t until almost the Cosby Show, Bill Cosby’s show, that in any way, African Americans were portrayed in a positive point of view, even going past having blackface. There were shows, which I think were maybe in the 1940s, 1950s. Oh, God, it just skipped my mind, but Amos ‘n’ Andy shows, those actors were African American, they were black. They were not in blackface. It just showed them acting like buffoons and that is how white audiences loved and choked it up and just laughed and just loved it. Really, it was until very recently. There has been a lot of negative stuff about Bill Cosby. We can go back to Diahann Carroll’s show, which was named Julia. Those were the shows that started to show African Americans in a positive light, not being inferior, but being equal. There is never any acceptance of blackface. The only thing that’s ironic is there were times that there were also black actors that were also put in blackface and they did it just because that’s the only way that they could get a job, but it was still for the same purpose, to mock, to make fun of, to belittle, dehumanize, degrade. Any negative adjective you want to think of, that is what blackface is. You’re only addressing one of the characters in that photo. There was, as you said, there was one character in blackface and there was another character in, I would say an even more offensive get up, the KKK robe and hood. When I looked at the picture, they’re standing next to each other, I think they both have drinks in their hands, and they look like they’re having a joke or it’s funny to them. Exactly, because that’s what blackface basically does. It makes fun; it mocks blacks. Like I said in my blog, the only thing that could have been worse is if the KKK person had a noose in his hand and was holding his cross. That’s the only thing that could have made it any worse than what it was. To think about that, too, to even dress up like this, I don’t know if you followed the Megyn Kelly controversy at all. I don’t want to misquote her, but my recollection of what she said when she was talking about blackface was that it was common or acceptable when she was a kid that people would dress up with blackface. I think she said specifically about Halloween, but I don’t remember her exact quote. She, of course, ended up losing her job just for saying that — she wasn’t saying that she had ever dressed up in blackface, I don’t think, and to take this situation where you have someone who did this in 1984, we’re not talking about 1884, it’s 1984, and not only do they do this, they think it’s so significant that they put it into their medical school yearbook page. What does that communicate to you? It communicates that obviously they knew about it and the backdrop, again, in terms of putting everything in context, what I’ve read is that how the yearbook pages were brought about is that each student had their page, that they would give to the editor of the year book and it was actually in a sealed envelope until individuals that were producing the yearbook actually was ready to work at it to get their materials into the yearbook. It’s just incredible how that whole thing came about. In terms of Megyn Kelly, Megyn Kelly was just controversial and, obviously, I would hope to think that as a journalist, she would have known what blackface was despite what she basically said. I am going to give her a little more credit than what she gave herself, because it was never ever acceptable, and I would hope that she would actually have intellectually known that and just basically spoke otherwise. Here is a twist on what she did say, Gayle, to maybe help your audience. My people, when we have costumes and we dress up for Halloween, we never paint our faces white. I mean, most characters that we are dressing up as for Halloween, when they’re in the movies or whatever, a lot of them are white characters, but you don’t see us taking out, you know, my mom was a nurse. She had to have her shoes always nice and crisp and white. You don’t see me trying to look for white shoe polish so I can paint my face white so I can be a white character. Not even if you were portraying Dracula? Okay. Maybe Dracula. I’ll go with that one. But you see what I mean, even with Dracula, it is basically still to be humorous and to be mocking. It’s not a character that you’re portraying, even if you were doing that for Dracula, it’s not a character that you’re portraying in a positive point of view. I don’t think anybody is portraying Dracula as a positive role model person. No. Definitely not. For sure not. I think that is interesting you talk about, I mean, it was a failure on multiple levels to even dress like that in the first place, then to take a picture of it, whoever took that picture, then to decide to put it on your yearbook page and presumably there is some sort of editing, like you’re saying, and then the school has it, from my understanding, the school keeps that in its library. People must have known that that existed. In your piece, you talk about the way that Governor Northam responded to the revelation about this picture. First, he kind of admitted it and apologized and it was a statement and then he had that press conference. I’m talking to you as a lawyer counseling a client, do you think he was given good advice? The written statement seemed like somebody had written it and then when he came and gave the press conference, it seemed like he was a different person talking. Do you think his advisors and lawyers and PR management team, did they do a good job of prepping him for how to deal with this crisis in his governorship? Obviously, he did not, in any way, know anything about what happened to Megyn Kelly, first of all. I don’t know why, but he obviously didn’t know about her problem. Yeah. Who really is the real — right. Who really is this person? I’m not really sure. That is just so incredibly stupid. When anybody looks back at photographs and I’ve been recently looking back at family photographs. When we look back at family photographs and have friends over and family over for the holidays, nobody looks at the family photographs — and I’m talking about ones where I came upon where I’m dressed up in a Halloween costume and I have a mask on. I know it’s me. I remember that that was my costume that I was in when I was 7 or 8 or 9 years old. I don’t say, “Oh, I’m going to have to investigate.” This was when he was 25. I think we all kind of know ourselves, because it just brings back the memory is what it brings back when you’re looking at old photographs, it brings back the memory — even when you’re looking at old photographs just from college, and this was from medical school, we look and we’re, like, oh, I know why I look at those. I say, “Oh, my God, was I ever that small?” but I know that’s me. Right. You make the point in your piece, too, that he has been so cloudy and murky in his response on this. You talk in your piece about things that happened 30 years ago, you can ask forgiveness for, but you point to the possibility that there might be other photos coming up and that came out in the press conference that he had dressed up with blackface to imitate Michael Jackson. Definitely he’s at least signaling that this could have been more than a one-time occurrence. Maybe it’s a pattern and practice, who knows. Right. That’s just really ridiculous. I think that the Michael Jackson part is the prime example of why he didn’t need to use blackface. Michael Jackson is modern day, so you could get the glove. You can get the little socks that he wore and the little black tight pants, the hat, everybody is going to know you’re Michael Jackson. All you need to do is do some moonwalks. No, he chose to do that, I think, for a specific purpose and a specific reason. Virginia was the first colony. It is just sad that 400 years after Africans were brought enslaved in this country, that we are still dealing with, albeit on higher and a different level, we’re still dealing with the fact that there are white Americans that do not think that African Americans are equal and that you, in some way, have to always belittle us even in medical school. This is Black History Month. That was the start of Black History Month for African Americans, right? No, no, no, but I mean this was the message that went out. Yes. Yes. This is the message that got it basically kicked off. I don’t really see how Northam comes back from this. Going back to your point about it was 1984, there is always forgiveness for people, but you have to go about it. What he should have done was long before he ran for Governor, he should have just have gotten that out. People that are in public life, you just know that some of those things that you did, and a yearbook is kind of sort of public. I don’t know how many people were in your medical school class and had a copy of the yearbook, so it could have really come out long before now. It could have derailed him early on in his career. You just need to come out and address it. That’s what we teach children. That’s what exactly what my mom taught me. Look, if it’s anything I need — I didn’t always to follow it — but if there is anything I need to know, please just let me know. I do not want to have to find out later that you actually did do this. Absolutely, good advice from mom. I think all parents should convey that advice and I’m sure his mother did, too. It’s kind of interesting, because Richmond was the capital of the confederacy. It has a long history of racial injustice and I think the city has tried very hard to overcome that and in a lot of ways, there has been good progress and good momentum. Do you think that this revelation and his lack of willingness to resign, communicates that there is something stubborn about this problem that perhaps people don’t recognize in this day and age? I think everybody in Virginia that was of any stature recognizes the problem, because he doesn’t have any support. All of the politicians on both sides of the aisle are basically not supporting him. I think the only politician that has supported him is former congressman Jim Webb. Everybody else, all the way up to Doug Wilder, who was the first African American Governor of Virginia, had basically said that he should step down. That includes people in his own administration. That are black administrators. They’ve not called for him, per se, necessarily to step down, but they will not speak out in his favor. Yeah. He doesn’t have any support. He has the black support from his pastor, but I have not seen him have any political support whatsoever, like I said, except for, as far as I’m aware, former congressman Jim Webb. Right. I pronounce it the way they pronounce it there. I am so sorry. So we’re all a part of our past. I’ve been to Richmond, both to court as well as for other things and if you’ve ever been to Richmond, the city of Richmond is still honoring the confederacy in terms of museums and in terms of just a lot of things. It has such a confederate flavor, at least the time that I was there was what stood out of me. I say all of that to say that’s what’s — as however progressive Northam is or the views that he had, that’s still a part, evidently, of his past that he did not give up. Right. He seems to not want to take responsibility for it and in Virginia it’s a one-term governorship. It’s very difficult to force him to resign. Do you think that he will end up succumbing to the pressure or is he going to ride it out? I think he’s going to ultimately have to succumb to the pressure because the bottom line is he lacks confidence. They can’t impeach him, he hasn’t committed any crime or anything or done anything allegedly illegal, but it’s very difficult when your administrators, your staff, you don’t have the confidence of the politicians that are serving, It’s going to be very difficult for him. He’s going to be worse than a lame duck governor. He’s not going to be able to get anything accomplished, because he’s lost the respect and the confidence of people that he would have to work with. I think that once he totally comes to realize that, obviously he doesn’t want to be, which he would be, the first governor in the Commonwealth of Virginia that would have stepped down since Civil War. He doesn’t want to have that legacy, but I don’t think he’s going to get past that legacy. I think Governor Wilder, who is revered in the Commonwealth of Virginia, has decided that he’s not lending his support as well. Do you think that this harms the Democratic Party in Virginia, and does it give rhetorical support to Republicans? I was reading another piece that you had written about how essentially the Democratic party takes African American women who support the Democratic party a little bit for granted. I think Republicans have been trying to get that message across for years and years and years. Do you think that creates an opening for the Republican party on that message or on that approach in Virginia, because of this outrageous and offensive photo and Northam’s refusal to take responsibility for it? No. Because I don’t think this goes past Northam. I think this is personal. I don’t think it goes to the party. What he did, I think is viewed more as personal. Virginia has been turning blue, from northern Virginia as well as the southern areas of Chesapeake, Virginia. 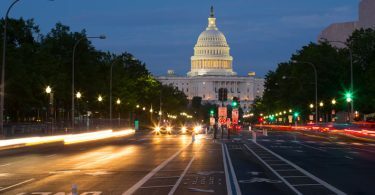 So I don’t think that this, in any way, what he did, I don’t think it in any way carries over to the party, because it is the entire party, the entire Democratic leadership, politicians, former politicians, that have overwhelmingly said, “You need to step down.” So there is no reflection on the Democratic Party on this, because everybody is telling him, on both sides of the aisle, you need to step down. Isn’t it interesting that Republicans have been faulted a lot for not doing their opposition research and unearthing this photo? Do you think something could be said, too, about the Democratic Party that they didn’t vet their candidate well enough? I don’t think so, because you can’t go back in every little piece of every person’s life. I mean, it was interesting that it was a Republican whatever. Yeah, website, that did unearth it. Obviously, I don’t think it was out of kindness and it had some ulterior motives there, but I don’t think that you can turn over every stone ever in any politician’s lives. You just can’t. You can’t reconstruct, I don’t know how old Northam is. It doesn’t matter. Even if he was, like, 40, you can’t reconstruct an entire person’s life in everything that they could have or done. That is why I say it was on Northam to get out from it and he could have used it very early on as a teaching moment. Just as much as on another instance where people have had attitudes about the LGBTQ community and their writings that they’ve had, but they come out from it, and they admit this is where I was then. This is how I’ve evolved. He really could have used it to embrace more African Americans just by showing, if this is something that I could have done, there are a lot of other people out there that have done far worse, but I’m willing to admit it. I’m willing to say I’m sorry. I’m willing to do everything I can to make amends going forth, but he needed to have done that so much earlier than now. You bring up in your piece about the photo of Senator Al Franken, which I have to tell you was horrifying to me, the picture on the plane, when he was coming back from an overseas appearance to the troops with a woman performer, and the photo shows that he’s essentially groping her chest and she’s sound asleep. You reference that photo in your piece. I’m curious how you find the two in terms of comparability. I didn’t think that Al should have resigned. Like I said, my whole thing as a lawyer is putting everything in context. It’s not just the matter of just looking at the photo of Al Franken and looking at the photo of Northam and making a decision about it. It is a matter, when I look at former Senator Franken’s photo, I think I put into context, like, you know you were a comedian on Saturday Night Live. That’s who you were. There are some things where, again, like I said, always looking at a person’s background, that’s how I view things. You are who you are in background. Maybe for that moment, as I saw it, yeah, you probably went over the edge, just as much as there are comedians who make jokes at, oh, I did not find that funny as a woman or as an African American, but it’s just who you are. The picture of him, I just think that it was more based on it was probably something that he thought was funny at the time, and it really wasn’t funny being a woman at all. I did not think it rose to the level that he should have had the pressure put on him by Senator Gillibrand to resign. I really didn’t. I see them as totally, totally different. I just put everything, like I said, in the context of what it is and the person. That’s why I brought up Northam’s background. That’s why I bring up Al’s background. I don’t see them being the same in any way. I think Al has apologized for it, but I don’t see it rising to the level of that he should have resigned because I basically can see it both ways. I can see it his way. I don’t see any way I can see Ralph Northam’s way. I really don’t. But I do see Al Franken that, okay, it was done in very poor taste. It was really bad, but it was just a joke. Do you think that would have been a prosecutable offense? I think that was probably overseas, so we’re talking about jurisdictional issues. Let’s take them out of the airplane, and they’re in Baltimore and he does that to her while she’s asleep and somebody takes a photo of that. Is that something that could be prosecuted? I mean, you have pretty good evidence. No prosecutor would prosecute that. No state prosecutor would prosecute that for the reasons that I’m saying, in terms of balancing what’s there and if you’re viewing it as the other side, you know, basically asserting, okay, I did it maybe, but I did it as a joke, an assault is an unwanted touching, so it technically would be an unwanted touching, but it would not rise to the level of anything you can prove beyond a reasonable doubt. It would be very difficult to get a conviction, I guess, is what I’m saying. Because you think there would be an intent element that couldn’t be met in that circumstance if he said, “Oh, it was a joke,” or something to that effect? No. There is no intent. An assault is an unwanted touching, but I’m saying that when a jury is looking at what the other party would necessarily say, “That I thought it was a joke,” I think that a jury reads all into that. It’s, like, no, we’re not going to convict somebody of something that they thought was a joke, however, highly distasteful it was and convict them of a crime. That is how prosecutors look at it on the beginning side. Are we going to be able to get the end result, and I don’t think you would be able to get the end result with Al Franken and I don’t think he should have resigned. Wow, that’s fascinating because I can tell you as a parent and a woman, that just seems like such offensive conduct, particularly given that the woman was asleep. It’d be one thing if her eyes were awake and Franken can say, “Oh, she was in on the joke or whatever,” but, wow, it’s no wonder we have the “me too” movement, the issues that we have between some of these men and women in these situations. It’s just kind of shocking. We’ll hold that for another conversation. I just want to thank you so much for coming on. And talking with us today. If people want to learn more about you or read your blog, where can they find you online? My blog is www.legalspeaks.com, and my Twitter is iamdebbiehines and my Instagram is also iamdebbiehines. 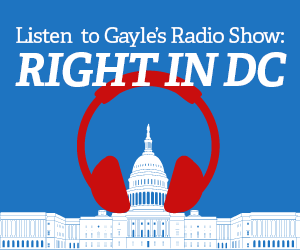 Thank you, Gayle, for having me. Much appreciated. This is Gayle Trotter. You can follow me on Twitter. You can follow me on Instagram. You can like me on Facebook. You can subscribe to my YouTube Channel. You can support this podcast on Patreon. This is Right in DC. Will Obama’s Iran Deal lead to peace or war?